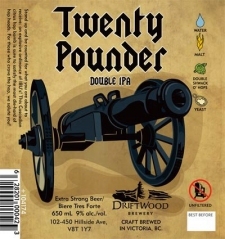 VICTORIA, BC – Driftwood Brewery has released their newest beer, Twenty Pounder Double IPA. Stand up and be counted for what you are about to receive… an explosive ordinance [sic] of IBUs! This Cascadian citrus hop bomb is sure to satisfy the most die-hard of hop heads. For those who crave hop – we salute you! Twenty Pounder Double IPA is available now at the Driftwood retail store and selected liquor stores in Victoria and area, and will be released in Vancouver stores later this week. I think someone means ordnance, not ordinance, unless Twenty Pounder does indeed deliver an explosive municipal law instead of a large transportable piece of gunnery. Good catch, Robert – that’s how it appears on the label, but I missed the error. I’ve added a [sic] to the quote.